Genes could be the reason why some people are targeted by mosquitoes more than others, research suggests. UK scientists have found that genes determine how attractive a person's body smell is to the biting insects. It is hoped the findings could lead to better ways of keeping holidaymakers safe from bites and the diseases they can bring. Malaria is a serious and sometimes fatal disease spread by female mosquitoes carrying a parasite called plasmodium. Other common diseases that can be spread include dengue and yellow fever. Travellers heading to countries where mosquitoes are found - particularly those with tropical climates - should err on the side of caution. A combination of medications, repellents, sleeping nets and loose clothing can help keep mosquitoes at bay. But the odd mosquito could find a way through these defences, meaning travel insurance is a necessity. Just one mosquito bite has the potential to put a person in hospital, so it pays to be protected. The researchers, led by Dr James Logan from the London School of Hygiene & Tropical Medicine, analysed 18 identical and 19 non-identical sets of twins. They found identical twin were more similar in their attractiveness to mosquitoes than non-identical twins. Identical twins share all the same genes, whereas non-identical twins do not. This suggests the mosquito effect is genetically driven. The trait had about the same level of heritability as height and IQ. In the experiment, Aedes aegypti mosquitoes - which transmit dengue and yellow fever among other diseases - were released into a Y-shaped tube that allowed them to choose between the hands of different study participants. 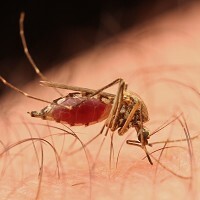 Some individuals who avoided bites were shown to produce a natural insect repellent that kept them safe. The findings build on previous studies linking body odour to the chances of being attacked by mosquitoes.